This is an attractive and unusual c. 1928 jigsaw puzzle map by Ernest Clegg. This puzzle, issued by Bert Fisher and Benjamin Pohl of the Firestone Tire and Rubber Company, is created from the original print advertisement of 1928 for Firestone Tire and Rubber. 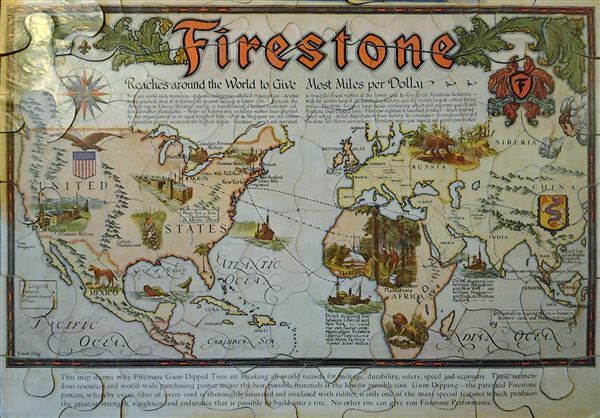 The map depicts the factories and plantation buying offices of Firestone around the world. The title reads, 'Firestone - Reaches around the world to give most miles per Dollar.' Factories and plantations are beautifully illustrated. The map also notes several countries and mountain ranges. Puzzle maps were first made in London by John Spilsbury in the 1760s. The style passed to the continent and became a popular educational tool in France and Germany in the early to mid-19th century. While rare and often in poor condition, these curious maps and atlases are among the most amusing and whimsical geographic themed educational devices, and in this case, advertising devices to appear in the 19th century. Notes on the bottom of the puzzle and under the title contain text promoting the company and the performance of its tires. Mounted on a board and dissected as a jigsaw puzzle, this map was originally drawn as a print advertisement by Ernest Clegg and later issued as a map puzzle by Fisher and Pohl, Lockport, NY. Generally very good condition. Wear and damage to box, especially at edges. Map puzzle is in very good condition and complete.